"MSM.01 - SAINT MICHAEL the ARCHANGEL - vintage, Italy/mid 20c (1.5 in.)" 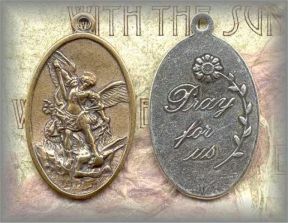 ||||| MSM.01: ST MICHAEL THE ARCHANGEL: A nice, large oval St Michael medal for use on chaplets and rosaries or to wear. Traditional. ||||| ABOUT OUR MEDALS: All medals are handcast from antique and vintage pieces in sterling and s bronze then antiqued to restore original patina.